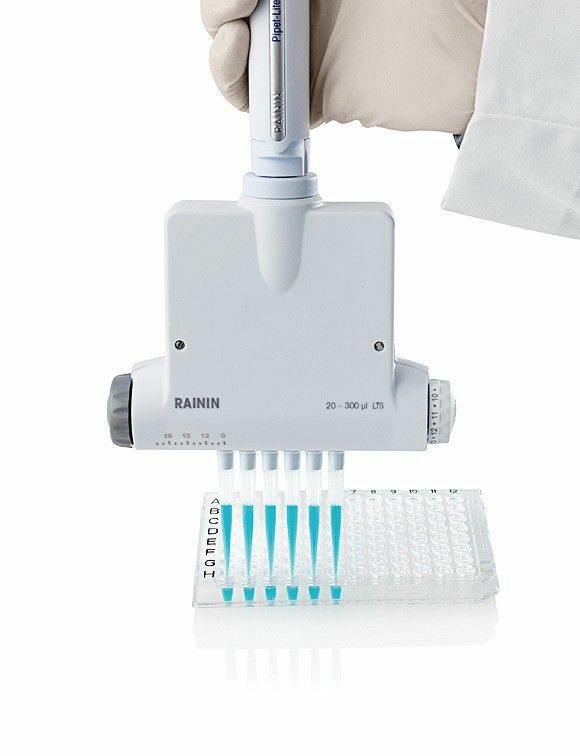 Nothing beats the ease and ergonomics of Rainin’s electronic E4 XLS Adjustable Spacer multichannel pipette for moving liquid samples between well plates, tube racks, vial racks, trays, gel combs and other receptacles of different sizes. The cushioned joystick control makes it easy to configure and run protocols, while the spacing dial's smooth manual movement makes continuous width adjustment a snap. Get consistent volume and identical speed for every step of your application. Automate cycle counting so you can concentrate on other details, and relieve your thumb with options to auto-mix or auto-dispense. It's easy to store settings so you can duplicate an assay later. Speed, ergonomic design and legendary accuracy make Rainin's electronic Adjustable Spacer the ideal variable-width pipette for genomic, proteomic and cell culture applications. Your data is everything. Trust the E4 XLS Adjustable Spacer electronic multichannel pipette to deliver! All piston movements are controlled by the onboard microprocessor, which moves the piston the set distance at the set speed, regardless of user. The advanced stepper motor has 4,000 discrete steps, providing highly precise liquid measurements. At the end of each pipetting cycle the E4 XLS adjustable spacer re-calibrates itself by resetting the zero point. Continuously-variable spacing allows nozzle spacing between 9-14 mm on 8-channel models and 9-19 mm on 6-channel models, suitable for pickup from 96-well plates and dispensing to 24-well plates or tubes, or vice versa. Smooth one-hand adjustment enables on-the-fly changing after aspiration and before dispensing. Spacing marks give a quick visual aid, or set the adjustable detent for repeatable spacing without looking. Purify biomolecules from proteins to oligonucleotides to chromatin using E4 XLS adjustable spacer pipettes and Rainin’s PureSpeed™ tips. Unite rapid and gentle processing of multiple samples with high elution concentration for an unbeatable combination! All E4 have the PureSpeed functionality pre-installed. Rainin provides this quick start guide to help you begin using your E4 XLS+ electronic pipette right away. Operating instructions for the Rainin E4 XLS+ single-channel, multichannel and adjustable spacer electronic pipettes.